In small bowl, mix salsa and mango. Refrigerate until serving time. In 9-inch glass pie plate, mix bread crumbs and coconut. Brush mustard spread on both sides of pork cutlets; coat with bread crumb mixture. In 12-inch skillet, heat 3 tablespoons of the oil over medium heat. Cook 4 pork cutlets in oil 4 minutes, turning once, until pork is no longer pink in center. Remove pork to serving plate; cover to keep warm. Repeat with remaining 3 tablespoons oil and 4 cutlets. 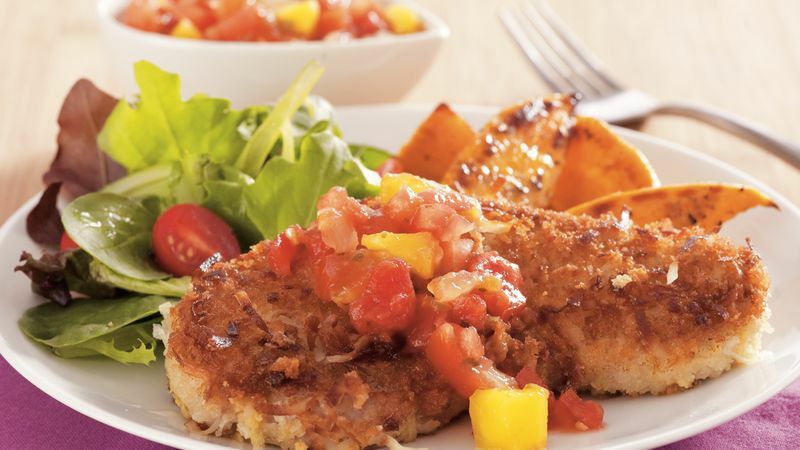 Serve pork with mango salsa. Substitute chicken cutlets for the pork, if desired.